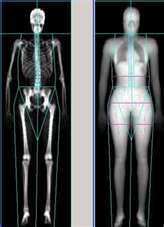 To accurately detect osteoporosis, doctors commonly use DEXA bone densitometry scan (the gold standard) to measure bone density and bone loss safely and painlessly by taking a low dose X-ray of your lower spine and hips. Sometimes an additional low-dose X-ray image, called VFA (Vertebral Fracture Assessment) will be performed of the entire spine. This allows doctors to see existing vertebral fractures, which may indicate the need for more aggressive treatment, even if bone density results are in the “normal” range. When doctors detect bone loss in the earliest stage, treatment, along with preventative measures, are more successful. Hip fractures cause the most morbidity with reported mortality rates up to 20-24% in the first year after a hip fracture. 10 million Americans are estimated to have osteoporosis. About 34 million more are at risk. What happens during the bone densitometry exam? During your exam, you will lay on a padded table while the bone densitometry system scans two or more areas, usually your hip and spine. Unlike typical X-ray machines, radiation exposure during bone densitometry is extremely low. The entire process takes only minutes to complete. It involves no injections or invasive procedures, and as long as you have no zippers or metal buttons on your clothing, you can remain fully clothed. Depending on the equipment used and the parts of the body being examined, the test takes approximately 20 minutes.